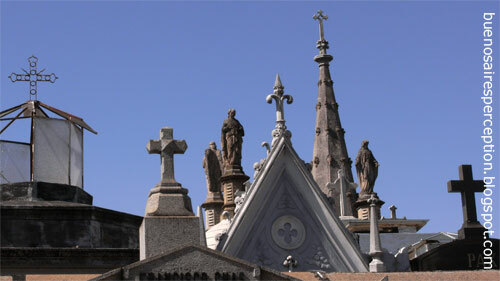 Several crosses and stone sculptures form a densely packed religious skyline overlooking the famous cemetery "La Recoleta". The cemetery in the heart of the city is one of the most popular and most visited places in Buenos Aires and has a world of exciting things to see. This would be a great photo for Skywatch Friday, "Evita." Great photo. Fascinating and a wonderful photo! Some of those sculptures are really beautiful and interesting.